Lake Wicwas enjoyed one fantastic summer-like day this week before the weather turned back to cool and damp. I expect I have enjoyed my last tranquil walk in the woods, being able to walk slowly without the constant buzz of mosquitoes all around. The black flies are out, and the mosquitoes will follow shortly. It is one aspect of summer I could do without! One warm day was enough to encourage the trees to push out their leaves – even the oaks now have tiny leaves on their branches, and the hills are painted a pale-green as photosynthesis begins. The tree pollen is very high right now, and is reported to be at record levels this year. 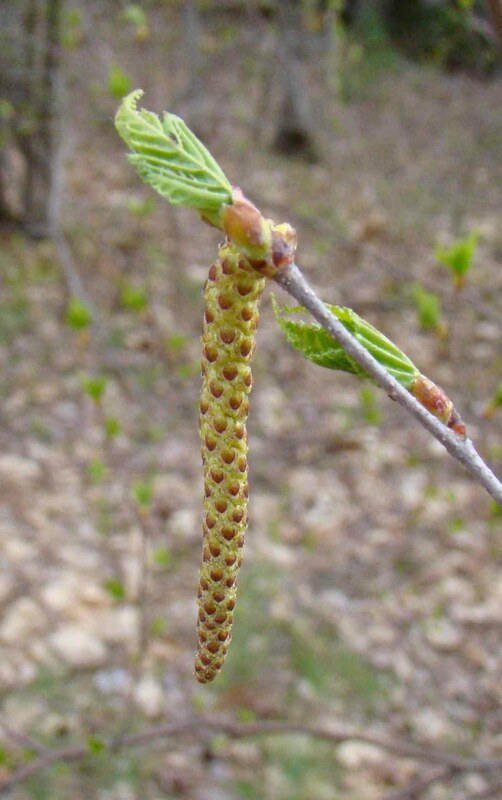 All trees have some sort of flower which produces pollen; this is the flower of a birch tree, getting ready to release its crop to us allergy sufferers. I think the Trillium is the most fabulous flower in New Hampshire, and there is a wonderful display of Painted Trillium right now on the Blue Trail in the Hamlin Conservation area. My feelings for trillium are likely based on my first experience with this flower. I came across it the first time on a group hiking trip in western NH. I saw a single Purple Trillium; I didn’t know what it was, but I knew it was something special. You can imagine my distress when the leader of the trip leaned over and plucked it off its stem, saying, “we’ll look it up later”. Ever since then I think I’ve felt a need to protect them (and felt a lot less respect for one particular trip leader). I have never seen a purple trillium again. The Hobblebush Viburnum is also blooming, joining the brightness of the Shadbush. This plant has an intriguing blossom, with a circle of large white flowers surrounding dozens of tiny blooms. Hobblebush can be seen along the Blue Trail as well as many other places around Lake Wicwas. Another white, blossoming tree is the Pin Cherry, which can be found along Chemung Rd at the edges of the swamps. In a few months this will be an important source of food for many birds. Speaking of birds, one can tell the insects are back by the Phoebes flitting out of the trees to catch an insect, and returning to its perch to wait for its next victim. The Swallows are also back, dive-bombing the insects just above the surface of the lake. 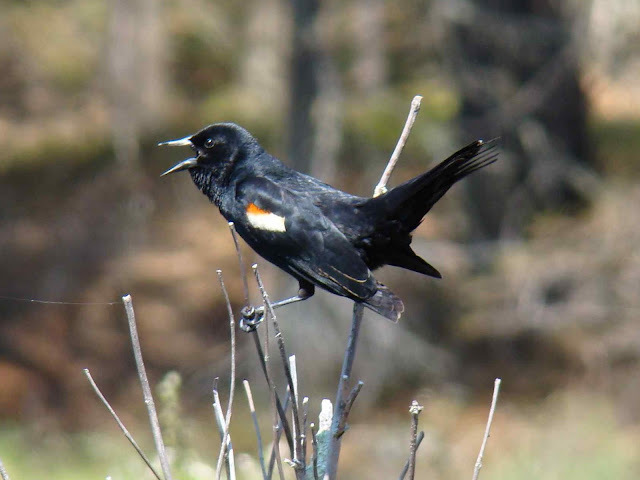 Red-winged Blackbirds have been frequenting the bird feeders rather than spending time out in the marshes.